You can find a cheaper kayak, but it will probably look like this in a few years. As the popularity of the See Through Canoe grows, more & more companies selling cheap imitations spring up. Although these imitations look very similar, there are some important differences that affect useability and especially lifespan. We build our products to last, and we don't sacrifice quality just to sell a cheaper product. We've been in business since 2007. 2007 News article. That's 10 years of experience with transparent boats! We aren't just a fly by night company that won't be here for you tomorrow. Since we've been around for 10 years, we know our product & we know it well. We know what it can do & what it can't. We know how to maintain it, get the most out of it, & we pass that experience & knowledge on to you. Your See Through Canoe will look good for many years. Other companies can't say this because they haven't been around long enough to even know what their product will look like in the future. We won't tell you something just to sell you a See Through Canoe. We only want happy customers. Integrity is everything. While other companies will tell you that their product doesn't scratch or that their "open deck" style kayak or canoe can handle rough ocean water, we prefer to downplay what the See Through Canoe can do. We know everyone isn't an expert paddler. The See Through Canoe has options. We offer whisper quiet motors with handheld remote controls, Bimini shade tops, UV protected canvas storage covers & more. 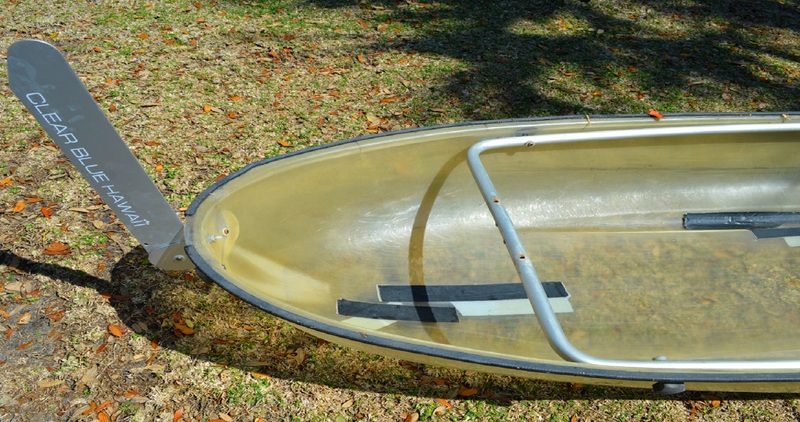 We carry replacement parts for all of our products including the See Through Canoe. We even offer replacement lexan hulls if you want to replace your hull many years down the road. We always have the See Through Canoe in stock. When you order one, you're going to get it, quickly. International orders may take some time, depending on the shipping option you choose. Our products are all quality ones. We don't cut corners to save money and we test & use our products. Almost all of our products are made in the U.S. Most of them are made in Florida by people that take a lot of pride in the work they do. We're active in our community. People know us around here. We're not just a faceless company. We can fill small & large orders quickly, if not immediately. Large orders are shipped in sturdy wooden crates. Your See Through Canoe will arrive assembled, not in a "kit". You will not have to put it together. If you order more than 2 See Through Canoes, we offer the option of putting 5 in one crate in order to save on shipping costs. In this case, some assembly will be required. With polycarbonates there is a trade off. If the polycarbonate is made to be to hard, then it will crack easily. If the polycarbonate is made to be to soft, then it will scratch easy. The polycarbonate used for the See Through Canoe is one that provides the best balance of these two factors. Again, we have 10 years of experience with polycarbonate boats. See Through Canoe™ began in Colorado in 2007. We've taken a different path than other companies & put product quality & customer experience first. The See Through Canoe transparent kayak/canoe hybrid has evolved from over 9 years of extreme field testing & consumer feedback. We've thrown bricks at it & ran it into sea walls at full speed with a motor on it. We've tested it in extreme freezing temperatures & hot tropical environments. Other companies have simply focused on producing the cheapest clear kayak/canoe possible, regardless of quality, useablitity, or lifespan of the product.